FTDNA has launched a new "Ancient Origins" analysis, and I've been asked a few times now what I think of the "Metal Age invader" component in this test. Essentially, I share the view of one of the commentators in the comments here. 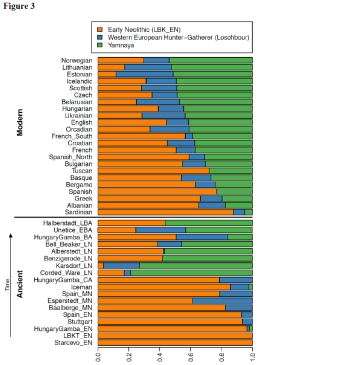 FTDNA now models Europeans as a mix of hunter-gatherers (Loschbour, La Brana 1 and Motala), early European farmers (Stuttgart, Iceman, LBK) and so called "Metal Age invaders" which are based on Corded Ware and Yamnaya samples - so the latter is what we more typically call "steppe admixture". (Plus they add non-European admixture in case someone has it very evidently.) This model looks crude for our present-day standards, and their results look very different from what I've seen here in Davidski's analyses or in other ancient-DNA calculators on Gedmatch, as their inferred proportions of steppe admixture are much lower, about half of that inferred by others. And moreover to me it looks completely wrong that FTDNA suggests that I (1/4 Italian, strong southwest European component) have more Metal Age invader admixture than my fully East Prussian grandmother. Indeed, any Early Bronze Age Steppe-inspired component should peak at 40-50% amongst Northern and Eastern Euros. This apparently doesn't. Why? No idea. I know better than almost anyone else that there's no such thing as a perfect ancestry test, and FTDNA has every right to offer an experimental analysis to its clients, so let's leave it at that. But if you want to see what an ADMIXTURE test with a half-decent Yamnaya component looks like, then check out my attempt HERE. These are graphs from the linked blog entry showing inferred levels of Yamnaya-related ancestry proportions for Europeans and West Asians. 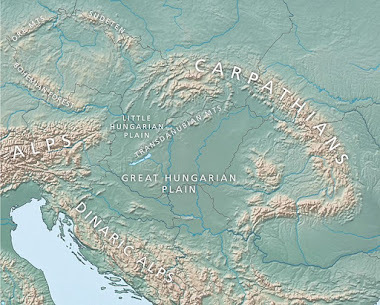 Massive migration from the steppe is a source for Indo-European languages in Europe (Haak et al. 2015 preprint). There will always be people who refuse to comprehend the basics of European genetics because of stupidity or because they don't like the facts. I'm speaking about half of the posters here. I have often though of the WHG as the great unsung heroes of the European gene pool. Perhaps the Steppe people claim all the glory and controversy. And the farmers brought the agricultural revolution, but, somehow, I cling to the prejudice that that under unable quality that made European peoples what they are - and what they accomplished - came from the WHG. It seems as though the modern Caucasus populations were used as reference rather than Yamnaya genomes. It's definitely inaccurate though. "I cling to the prejudice that that under unable quality that made European peoples what they are - and what they accomplished - came from the WHG." I think it's important we understand the origins of culture and accomplishments is complicated, doesn't have a single source, and has a lot to do individual uniqueness and can't be largly explained by the passing down of culture from ancestors. It looks more like modern Kalash. Testers from Trabzon region report <40% while Pakistan and North India can get 60-ish. Nah, it's not from drastic LD pruning. It looks like whoever did this at FTDNA just assumed that they could get accurate Yamnaya ancestry proportions by running ADMIXTURE in supervised mode with Yamnaya and Corded Ware as "Metal Age invader" references. But ADMIXTURE doesn't work like that; its output is influenced by the whole dataset, not just the samples marked as references. So what appears to have happened in this instance is that ADMIXTURE used the Yamnaya and Corded Ware samples as a rough guide, and then went on to create the usual Caucasus/Kalash component rich in Ancient North Eurasian (ANE) admixture. They need to add a separate Hindu Kush component on top of the Yamnaya. They just need to get the Yamnaya-related ancestry proportions more or less correct. That would be nice, since their "Metal Age Invader" component is really muddled for Central Asians and South Asians (I'm at 55% "Metal Age Invader", 26% "Farmer", 5% "Hunter-Gatherer, and 14% "non-European". I guess the 14% "non-European" is eating up my 10% ASI and 4% East Asian/Siberian admixture). But then again, what's the point of having a "Hindu Kush" component, when we know that "Hindu Kush"-like components are always mixtures between Iran_Neolithic-related and BA steppe-related ancestries? I think things would look way better, if they use the new Iranian samples for another Neolithic component. This would really clean things up. Their current Neolithic component could be called "Anatolian Farmer" and they could call the ancient Iranian-based component "Central Asian Farmer". When it comes to analyzing samples/populations in the context of Neolithic and Bronze Age ancestry, your Yamnaya_K7 was/is the best ADMIXTURE test I've ever seen. When you get some time, some leisure, and have the desire/inclination to do so, do you think you could update your Yamnaya_K7, by adding an eastern Neolithic component? Of course, only when you find the time, and interest, to do so. And obviously, only if it actually works out, shows sensible results. What about the concept of "the sum is more than its parts"
Based on a phenotype I expected for Northern Europeans to have Neolitic farmer genes in a highest percentage. My paternal Grandmother MtDNA K2 lineage comes from Venne Germany. Today the hotspot for K2 is Belgium. MtDNA K2 is Neolithic Farmer lineage.